Flash forward about 2 years from when Sabbath first began their own campaign of “shock and awe”, and the band found themselves delving further into the experimental possibilities opening up to them and the rest of the rock music world. Interestingly enough, this era saw an approach to song creation that relied a lot less on signature riffs and more on lyrics, rhythm section work and atmosphere. Though I personally regard “Vol. 4” as the weakest of Sabbath’s first 6 and classic Ozzy albums, it was a very interesting and very different approach from the loose jams of the 1st album, the signature riffing of “Paranoid” and the crushing heaviness and aggression of “Master Of Reality”. “Tomorrow’s Dream” is probably among the least interesting songs for any guitarist of more than 1 year’s experience to learn, consisting of two riffs that are essentially three chords and a bridge that is only slightly more complex. But what is going around all of this is much more interesting, particularly the double bass drum work of Bill Ward, a practice that was not really as common in 1972 as it would become in 1983. Combined with a bass line that wanders around a fair bit, what is accomplished is a sort of rumbling back drop that seems to create two dimensions in the song, one for the rhythm section, and the other for the guitar and Ozzy’s vocals. The singing on this song is really formulaic, and tends to play off the simplicity set forth by the guitars, but does make for a nice sing along tune for anyone on a long commute. 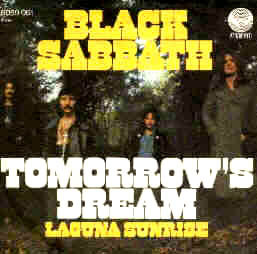 “Laguna Sunrise” is among the more famous of Iommi’s many acoustic guitar caprices. It has a highly repetitive but catchy acoustic guitar theme that loosely resembles “Over The Hills And Far Away” by Zepplin, which is interesting considering that “Vol. 4” came out about a year before “Houses Of The Holy” did. There’s a nice little string orchestra backdrop to this, but for the most part it listens like a somewhat redundant acoustic guitar duo with no vocals. Nonetheless, it probably paved the way for such interesting instrumental preludes such as “Sphinx (The Guardian)” and “The Scarlet Pimpernel” down the road. Basically this is more fodder for completists and rarity hounds. It’s extremely hard to come by in its original vinyl form, but is also available in CD form thanks to a limited edition compilation of Ozzy era singles along with 5 others. It’s among the weaker of single releases to come out of the band during their high period in the first half of the 1970s, but it shows a band in evolution, moving towards their most defining albums in the mid 70s in “Sabbath Bloody Sabbath” and “Sabotage”. They say that not every experiment in the science lab can be a successful breakthrough, but even lesser discoveries have their merits.